The Methos Chronicles is online! Third attempt. Now this is more like it! 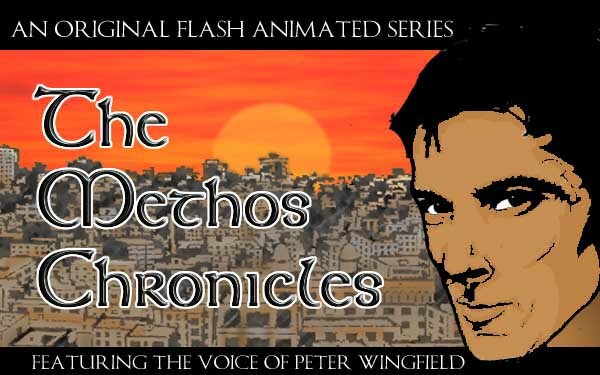 The Methos Chronicles Official Fan Website is online at www.TheMethosChronicles.net. The animated series isn't available yet but there are photos of Peter recording his voiceover from October 2000, a message board where you can leave your thoughts, and a new drawing of animated Methos, which is much improved — no more flying swords and animated-GIF overkill! The PWFC has confirmed that Peter did (as in past tense!) record the voiceover for The Methos Chronicles sometime in 2000. There's just a Network Solutions "under construction" page there now, but bookmark it for the future! While checking out domain names that contain "methos" in the name, www.TheMethosChronicles.net popped up. 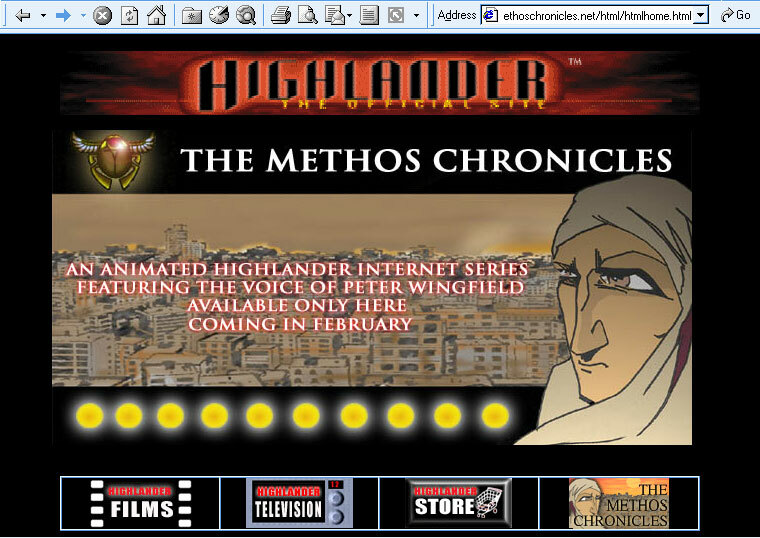 At that URL was what appeared to be a prototype design calling itself "Highlander: The Official Site" and advertising "an animated Highlander Internet series featuring the voice of Peter Wingfield... Coming in February"! TheMethosChronicles.net domain name was registered by Josh Davis, son of Peter Davis, who is the Davis in Davis-Panzer Productions, the owners of the Highlander franchise. The address in the domain name record is Davis-Panzer's Los Angeles office. The site also contains graphics and content duplicated or derived from the current official Highlander site, including an identical ad for the upcoming Highlander: Endgame DVD, which means that the site was put up (or updated) recently. 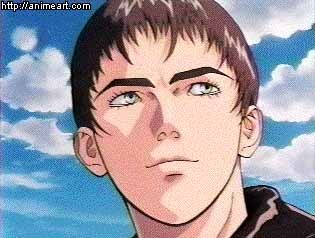 But with a larger nose, of course! Meanwhile, on the alt.tv.highlander newsgroup, Gillian Horvath, former Highlander staffer and editor of An Evening at Joe's, confirmed that the animated series is for real.